Ideal for cutting red meat, this solid maple wood carving board has permanently installed steel spikes to hold the meat in place. The cut-out grooves on this wood carving board drain the meat juices into a small well, where they can easily be collected for use in sauces or other recipes. This carving board is wonderful! The spikes hold the meat in place and the moat holds the juices. A great buy, highly recommend. After looking for a couple of years at cutting boards to use for the Thanksgiving turkey, we finally settled on this one. Overstock had a fantastic price, and we were not disappointed. A great product! Spikes held the meat in place and really deep wells caught all the meat's juice. We will probably add something to the bottom to keep the board from slipping around on the cabinet, but other than that, it was the perfect product for our needs. And I'm sure we will find many opportunities to use it throughout the year: roast, brisket, rotisserie chicken, etc. 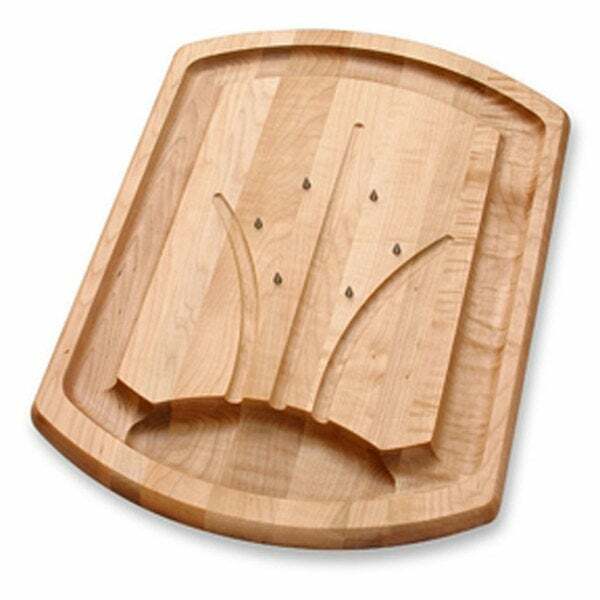 I'd seen carving boards of this type for more than twice the price, many very highly priced because they had a drip tray on the bottom. That's fine but not high on my list of needs. The wells on the sides gathers up excess juices, and the spikes hold the roast of any time in place. It is so much better than my conventional carving board. I highly recommend it. This meat board is perfect. I like the fact it's collecting juice & it's easy to cut. Highly recommended! Holds a slippery thanksgiving turkey in place for easy of carving. Catches the juices for gravy. I have been searching for a board like this at a reasonable price for a long long time! It's wonderful quality and I expect many years of use from it. This is a great carving board, very high quality. This cutting board is expensive, but it is a high quality product! It is very large, durable and effective. It was a real asset for Thanksgiving! I shopped around and Overstock had the best price on this product. My last carving board lasted over 30 years. When it finally died, I looked long and hard for another that was just as sturdy. This seems to fit the bill. Received very quickly. It's exactly what I needed for a gift. Looking forward to using it. Great size for a big turkey. Worked kuat as I hoped. I added rubber feet to the bottom so it wouldn't move around. The cutting board is starting to crack in half. I hand wash it after every use and dry it by standing it on edge and it still cracked. Liquids just poor through. I have had it for two years. Worked great until blood went all over my counter.